Just another irresponsible beardie owner here • Bearded Dragon . org . Four days ago I went to the pet store to buy a cat scratching post, when I walked by this little guy. He was jumping against the window and even waved at me. My heart melted, I thought to myself that he wants me to take him home!! Next thing I know the pet store employee is telling me all about him and I'm holding him and I want him, so the emotional side of me decided to bring him home. I bought a pet med reptile kit as the employee told me that is all I would need- and jeeze I wish I did my research ahead of time because most of it ended up being trash. Day one, little dude won't eat anything. Not carrots, not crickets, not kale or lettuce or the pellets. I start doing some serious research and readied myself for a visit to the pet store the next morning. Day two, he eats two whole bites of kale from my hand and my heart melts all over again. I grab a ceramic bulb and fixture from my local store as well as some thermometers and meal worms. That night he eats a cricket and nothing else. He seemed to be still sleeping on the cold end of the tank where he initially was when I woke. Day 3 I get 10.0 bulb and fixture and have my lights on a timer. He sleeps most of the day on the cold side and only eats two crickets, won't eat mealworms or veggies. My cold side runs at about 73 degrees, mid is right at 86 and far side at 101 degrees. And he spends 80% of his day in the coldest corner of the tank, 10% warming up and the other 10% he spends glass surfing. I really wish I was more prepared and didn't do this so spar of the moment. I'm really worried about the little guy. He's not eating much and has barely pooped. I don't know how to help him or what else I can do. I just want him to be healthy and happy. Any advice at all ? I'm using the Reptisun 10.0 t8 bulb. I do only have one UVB bulb in there, a basking light, and a ceramic heater. The basking temp is right at 100-101 degrees. I believe my tank setup is right to spec, but I will stop feeding him crickets and mealworms once my dubia come in the mail. He seems to be doing a little bit better today, thankfully. Maybe it is just relocation stress. I'm not sure what you mean, it is inside the tank. Should it be positioned differently? Hi there, most of this can be attributed to relocation stress. 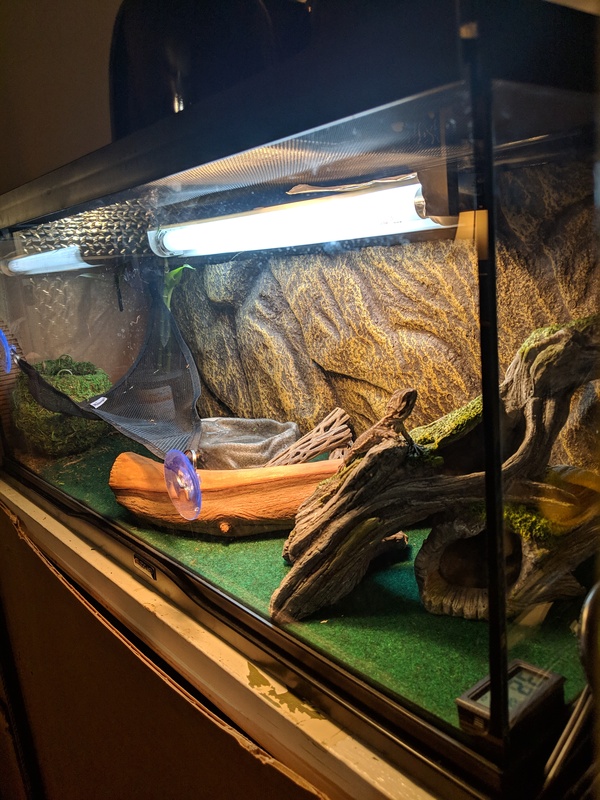 Your uvb is in at a good height but could be better if it was positioned in the middle, attached under the screen .I raised many clutches of babies and one thing to start off with is a less cluttered tank. 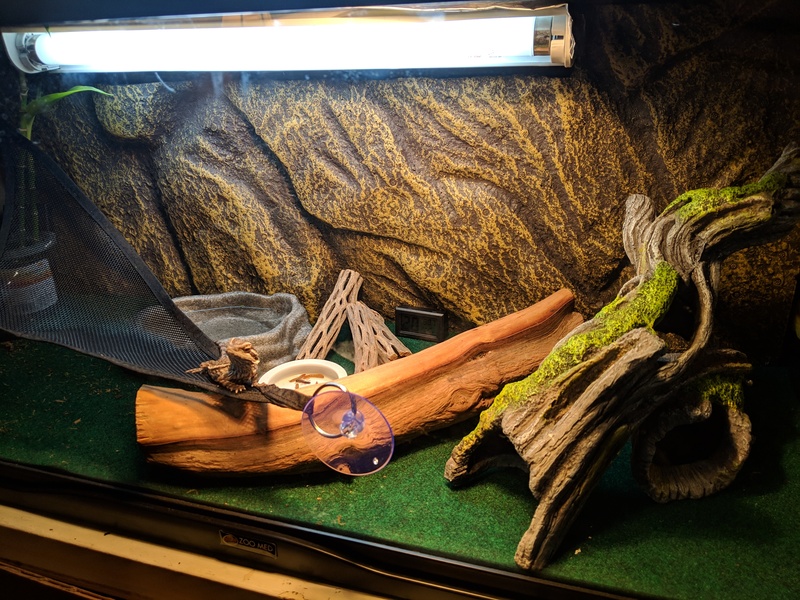 Put his basking log under the heat + uvb so he'll spend time there and remove the other bits of tank decor. 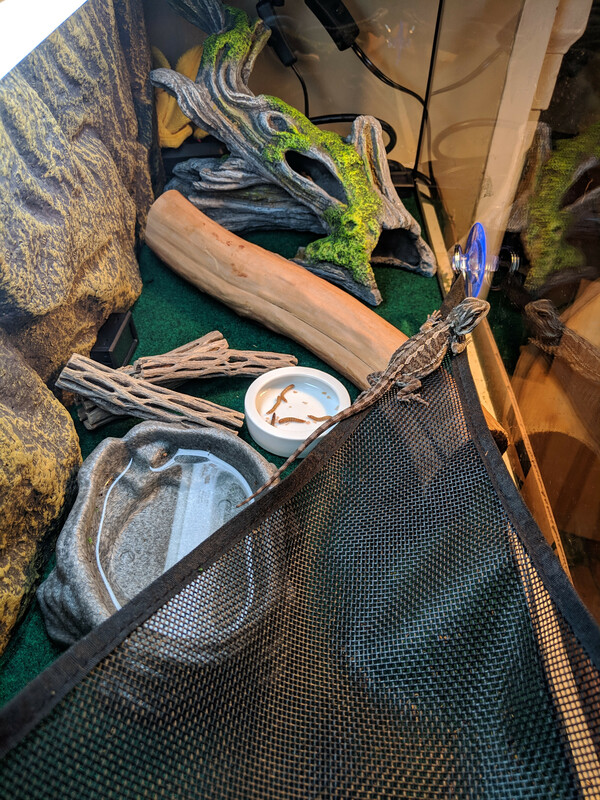 That makes it much easier for him to find his foodbowl which should be right near the bottom of his main basking log. He should settle in soon enough, just remove most of the stuff and keep it simple for now. After a while you can add a new oiece every couple of weeks. He should be fine . AHBD wrote: Hi there, most of this can be attributed to relocation stress. 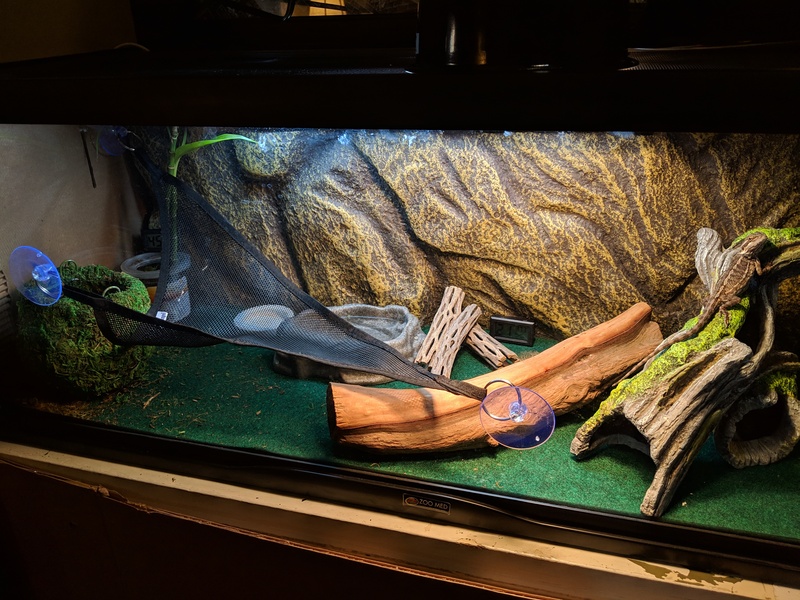 Your uvb is in at a good height but could be better if it was positioned in the middle, attached under the screen .I raised many clutches of babies and one thing to start off with is a less cluttered tank. 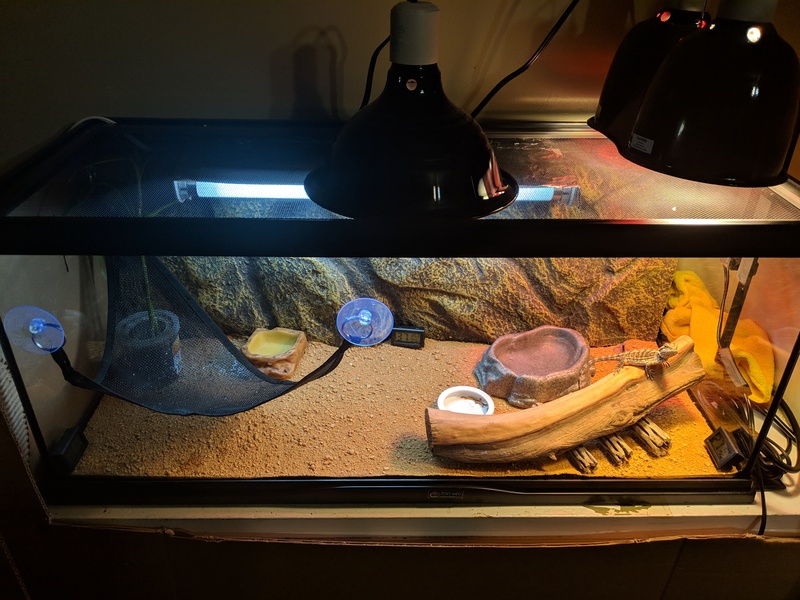 Put his basking log under the heat + uvb so he'll spend time there and remove the other bits of tank decor. 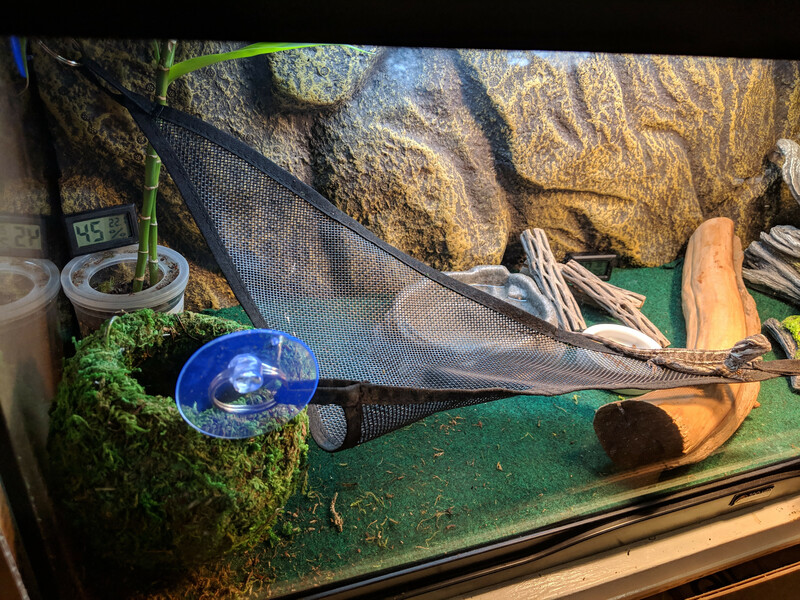 That makes it much easier for him to find his foodbowl which should be right near the bottom of his main basking log. Is this still too much? That's good, he is making very rapid progress. I don't think you'll have any problem then really. Carry on as you have been, he's settling right in ! You mentioned you intended to buy a cat post. NO MATTER WHAT YOU DO , the cat/s MUST NEVER BE ALLOWED IN THE SAME ROOM . NEVER let the cat/s anywhere near the dragon when it's out of it's tank. When the dragon is coming out (even for a cuddle) , the cat/s must be banished to another room , NEVER get the dragon out of it's tank if a cat is on the loose in the room or anywhere in the house (lock they cat's away FIRST). I can't emphasis how important this is. THEY WILL NEVER BE FRIENDS and the cat/s pose a huge danger to the dragon. You can never train the hunt and kill instinct out of a cat, the cat/s see the lizard as prey and are working out how to get to it. Your tank has a mesh lid , IT IS NOT CAT PROOF , a determined cat will rip through wire mesh even (even wire mesh !! - I've seen this done to bird aviaries where wire mesh was supposed to prevent cats from getting to the birds, and to outside lizard pits with wire mesh over top). option 4 : invest in a solid timber front opening tank or build one for the dragon. 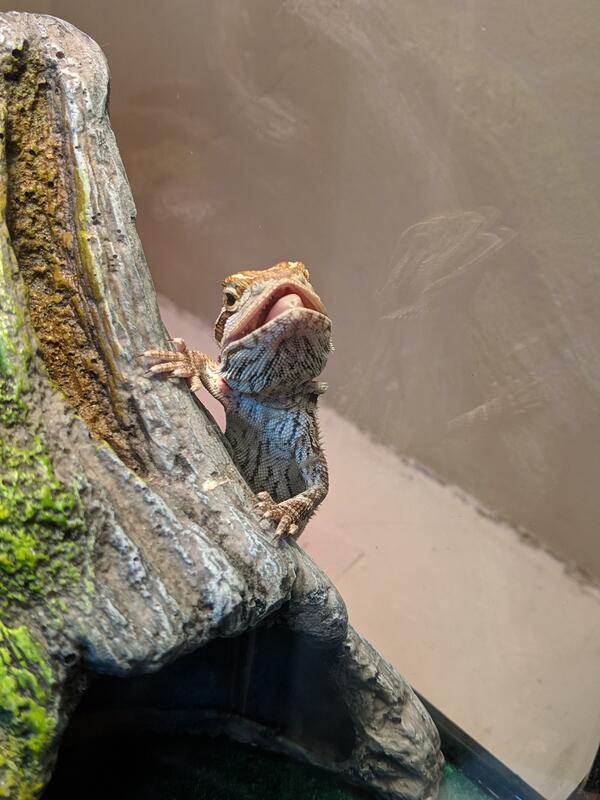 Crickets are very good feeders , just make sure they are suitably sized, gut loaded with fresh greens and good wholesome food (repcal adult bearded dragon peppets straight from the bottle are great food for insects) , and dusted with calcium (EVERY DAY) and calcium and vitamins on the weekends. I suggest feeding in the tank , only deposit a few crickets in the tank at a time, let him catch and eat them , repeat , when he no longer shows any interest in eating the insects = he's full and that's your cue to stop. AT HIS AGE AND SIZE , I recommend 3 feeds of live insects per day and a 14 hour photoperiod (as a minimum). Guidence on uv : viewtopic.php?f=34&t=235611 , I highly recommend returning the existing T8 tube and hood and exchanging for a T5HO reflector hood and an Arcadia T5HO 12% UVB tube. I'd remove the water dish , very rare for bearded dragons to drink from ponds of standing water. It will increase the humidity too much in the tank. Be aware shade cloth type mesh hammocks like you have are a serious nail and toe snag hazard for bearded dragons. I'd remove the mesh hammock.